Sitting atop the rolling hills at the southern end of Patong Beach, Pra Nang Villa overlooks a vast expanse of turquoise seas and Phuket’s scenic coastlines in the day, and a string of glittering lights along Patong’s happening night scene after dusk. This modern vacation abode is ideal for accommodating large groups of friends and families travelling together. Plush beds and tasteful fixtures bedeck all five bedrooms in the villa. Each bedroom is decorated in a different theme colour, ranging from a bold, striking red or brilliant blue, to a cool, silvery gray or light, soothing yellow. A private balcony extends out from all the bedrooms, offering an inviting spot for guests to cosy up and enjoy sweeping views of the ocean. 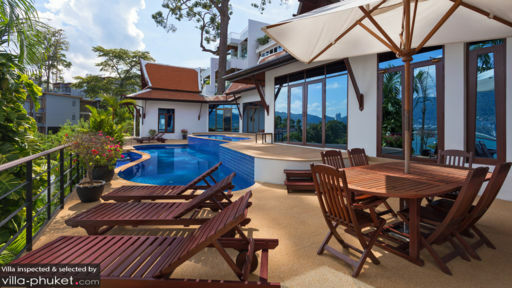 Enter Pra Nang Villa, and you will be welcomed with an assortment of refreshments. The friendly staff will hand out chilled beers, soft drinks and fruits upon your arrival. Start your stay on the right note by taking a dip in the cooling waters of the free form swimming pool. Arm yourself with an icy drink, and lay upon the sun loungers for a lazy afternoon of sunbathing. When dusk beckons, enjoy a round of sundowners by the pool deck while gazing out at the breathtaking sunset scenery. Pristine white walls and furnishings in earthy hues adorn the living areas of Pra Nang Villa, and a selection of quirky oriental ornaments add an Asian accent to the modern interiors. 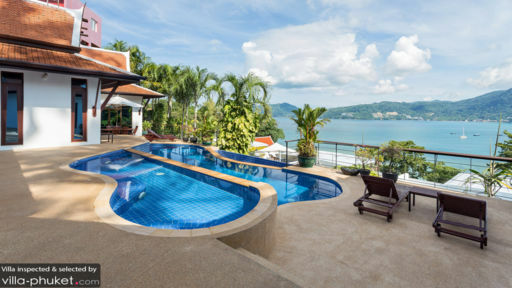 Keep the sliding doors open all day, for they reveal a stunning view of Patong’s coastal areas, and allow plenty of sunlight and sea breeze to flow in. 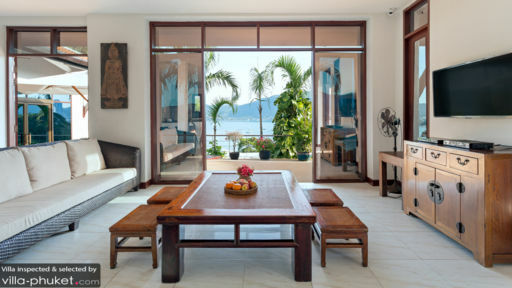 Well-equipped with a variety of amenities, there is something for everyone at Pra Nang Villa. Fitness junkies will enjoy working up a sweat in the gymnasium, while the young-at-heart will be happy to while their hours away in the games room. The surrounding region around the villa holds a huge amount of interest. A variety of beaches, shops, restaurants and bars are located close by, and a quick five minutes is all it takes for guests to venture out to explore these areas. Foodies will be spoilt for choice when it comes to picking a dining spot for a lovely dinner outdoors, while night revellers will enjoy an eye-opening discovery of Patong’s pulsating nightlife.